Tyrolean Jet Services' Airbus ACJ319 is on display at NBAA 2014. According to Martin Lener ceo of Tyrolean Jet Services, which was established in 1978, this is the next expansion milestone. "We are more than happy to first announce at NBAA a brand new and highly demanded Gulfstream G650 to join our unique collection of business jets, ranging from ACJ319, ACJ318ER, Global Express, Gulfstream G550 to several midsize business jets in 2015, beside our private operated aircraft fleet. "This is the next milestone in Tyrolean Jet Services' organic and sustainable growth. As Austria's longest established business operator with people who have made our business what it is today, TJS offers executive and vvip charter flights, family office style aircraft management services, CAMO and aircraft maintenance services, concierge services and airline flights available from our in-house IATA travel agency – everything on a 24/7 basis." For more than 35 years TJS has established a solid relationship with charter and aircraft management clients in regard to the safe and reliable operation of its fleet. 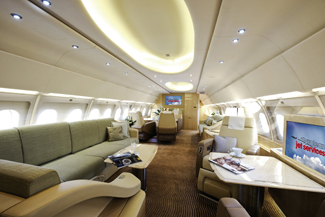 Guests attending NBAA will have a unique opportunity to discover and experience a “lifestyle beyond expectations” in the very spacious cabin of the TJS ACJ319 OE-LOV aircraft. Aircraft management services for commercial and private operations have a long tradition at TJS and are offered in a very customized way to aircraft owners and asset management companies, to assure transparent financial and operational advantages for a safe and efficient operation of their assets.